The Family Nutrition Program Food Access and Availability Initiative is partnering with local Virginia Cooperative Extension staff and volunteers to provide cooking and gardening demonstrations at farmers markets across the commonwealth. Their presentations on container gardening point out that SNAP benefits can be used to purchase food-bearing plants. In Virginia, more than 3.1 million households are food insecure, meaning they do not have reliable access to sufficient quantities of affordable, nutritious food. 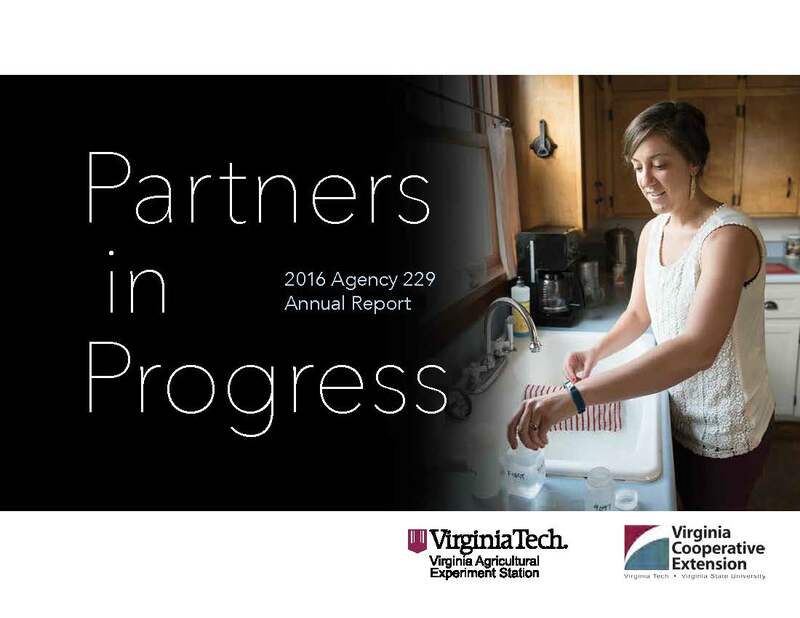 Virginia Cooperative Extension is working to alleviate food insecurity through its Family Nutrition Program Food Access and Availability Initiative. The project focuses on increasing access to local food systems, especially through farmers markets and gardening projects. “We want to raise awareness that SNAP benefits, or food stamps, can be redeemed at many farmers markets around the commonwealth. We also want to support markets in outreach and educational efforts for SNAP participants,” said Meredith Ledlie Johnson, a project associate for the Family Nutrition Program who manages the Food Security Project. In 2014 Johnson and her colleagues developed an online marketing toolkit that allowed farmers market managers to download an Electronic Benefits Transfer startup manual and marketing materials such as posters, postcards, and recipes they could use to promote the program. Managers must apply for grants from organizations that offer funds for preventive care, such as nonprofit hospitals, churches, and credit unions. These grants are used to match the U.S. Department of Agriculture SNAP benefits to give consumers more buying power at the markets. 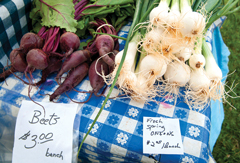 Currently 81 farmers markets accept SNAP benefits out of approximately 240 markets in Virginia. Family Nutrition Program staff, student interns, and volunteers also provided cooking demonstrations at 23 of the farmers markets that accept the EBT cards and reached more than 2,300 people in 2014 with simple, low-cost ideas for preparing local and seasonal produce. Recipes distributed during these demonstrations included information about local FNP adult nutrition classes. In 2015 the Food Access and Availability Initiative expanded to include billboards, bus signs, and posters that are placed in food-insecure neighborhoods that advertise the use of EBT cards at farmers markets. The project is also partnering with local Virginia Cooperative Extension staff and volunteers to provide additional promotions and cooking and gardening demonstrations at farmers markets across the commonwealth to increase visibility of how Extension provides broad programming from farm to fork. Johnson wants SNAP consumers to know that despite perceptions that farmers markets are expensive, shopping at farmers markets can help them stretch their food budget because so many markets provide matching funds to SNAP consumers. Also, buying locally often means they are getting fresher products that taste better. “Introducing SNAP consumers and farmers market shoppers as a whole to new foods and offering them chances to taste new ways to cook them often encourages them to eat foods they thought they didn’t like. Also, when kids see the vegetables fresh from the field and not coming out of a can, they want to try them,” said Johnson. According to Johnson, millions of dollars each year are remitted to families through the SNAP program with less than 1 percent being spent at farmers markets. “We have a huge opportunity to not only help SNAP consumers purchase and consume more fresh fruits and vegetables, but we can also help promote local agriculture and capture some of these funds locally,” said Johnson. What’s for dinner? For some, making a quick run to the grocery store for fresh produce is not an option. In Suffolk, Virginia, some families must travel as far as 25 miles to buy fresh produce. In short, they are in a desert — a food desert. The U.S. Department of Agriculture defines food deserts as “low-income communities without ready access to healthy and affordable food.” Food deserts can be attributed to an absence of grocery stores, farmers markets, and healthy food providers in an area. “It’s very alarming when we have people going to North Carolina because groceries are so far away from them,” said Marcus Williams, an agriculture and natural resources Extension agent in Suffolk. Extension agents like Williams want to reduce the prevalence of food deserts in Virginia. With the help of the Obici Healthcare Foundation, Williams and his colleagues from Virginia Beach, Newport News, Virginia Tech, and Virginia State University have started an initiative to help those living in food deserts. Red Cross supplied cookbooks and educational materials. During each event, participants learn about food deserts and what is being done in their communities to improve access to fresh foods. Through hands-on activities, participants also learn about vegetables, nutrition, cooking, and finances. During lunch they have an opportunity to ask questions and network with other participants and experts. At the conclusion of the event, participants are given fresh produce along with a Buy Fresh Buy Local guide, a colander, measuring cups, and the American Red Cross cookbook. During four food desert events, more than 4,000 pounds of produce were distributed to 176 people. As community members become more educated about buying fresh, local produce, local farms are also seeing benefits. Because of these events, four local farmers have seen 10 percent increases in fruit and vegetable sales. Over time, Williams would like to see these programs become self-sufficient. He also wants to provide even more programs and resources to the communities. One idea is to create a mobile farmers market to bring produce to food deserts throughout the city. This form of food hub would in turn help local farmers have an outlet to sell their fruits and vegetables at reasonable prices.